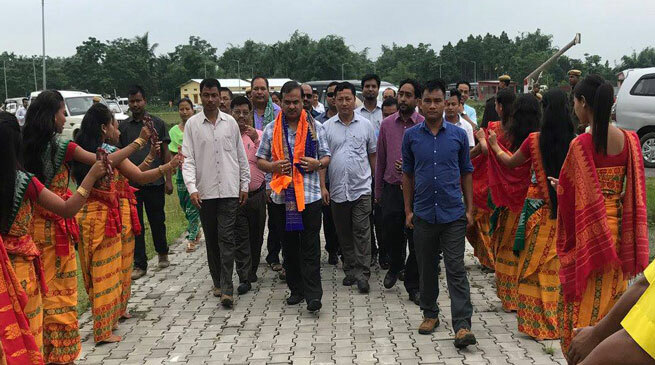 Assam Education Minister Himanta Biswa Sarma on Friday visited Bodoland University and Bineswar Brahma Engineering College in Kokrajhar and Inaugurated RFID & Digital library at Science College. Sarma wrote on his fb wall “I visited Bineswar Brahma Engineering College, Kokrajhar to review college facilities and interact with students, faculty. I am extremely glad to share that we announced a grant of Re 20 crore to the college which shall be utilised towards construction of a 250 seat girls’ hostel, procurement of 2 buses for transportation, construction of an administrative block and early recruitment of all vacant positions”. Talking to Reporters, Sarma said his visit to Bodoland University and Bineswar Brahma Engineering College is to see and review various developmental works in the institutions. The Education minister said necessary steps are being taken for the development of the Bodoland University, including filling up of posts. Both the leaders arrived in a chopper at SAI complex were accorded a warm welcome with traditional Boro arobai by BTC chief Hagrama Mohilary, his deputy Kampa Borgoyary. The BJP president Ranjit Das said the BJP wants to strengthen the party activities in the BTC and also the strengthen the coalition with the BPF. The Assam BJP president had also demanded to induct Dharma Narayan Das, the lone BJP member in BTC as an Executive member in the BTC and also involved the BJP karyakartas in developmental schemes in the village council development committee(VCDC)s in the BTC region.